Going into Press Start to Play, one may be a bit hesitant: Hmmm . . . science fiction stories about video games? Interesting concept, though how far can this be taken, before the gimmick gets exhausted? Based on the strength of John Joseph Adams’ previous anthologies, any hesitant reader may wish to turn off Call of Duty and flip to page one. Because, as it turns out, there’s nothing gimmicky about this anthology and, moreover, the depth the authors take the subject is inexhaustible; In short, this is one of the best anthologies published in 2015. From pixel pong games to console immersion, this is an exhilarating journey through the levels of penned speculation. 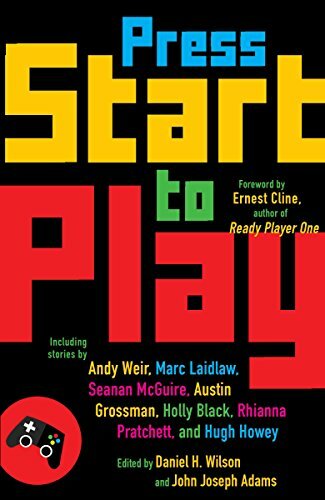 In addition to hard science fiction, there is a wonderful blend of dark horror, high fantasy, adventure, and insightful literary merit to these stories, which ranges from characters becoming part of the game they were playing, the effects of gaming on society, fantastical blendings of gaming and real life scenarios, the future of gaming, and even imaginings of how gaming can save the world. The standard caveat applies, that not all stories will appeal to all readers, such is the balance of including a diverse mix of unique writers; but most of the tales in this book will be found appealing in numerous ways. “Desert Walk” by S.R. Mastrantone—A slow-build mystery about a rare cartridge game, where the player does little but walk in a desert. Just subtly chilling enough to leave the reader with ineffable feelings of dread. “Rat Catcher’s Yellows” by Charlie Jane Anders—A touching vision of the curative effects of living in an augmented reality. “Survival Horror” by Seanan McGuire—Funny, smart, riveting. A half-incubus and his cousin—the granddaughter of a witch—are trapped to play an evil (i.e. hacked) video game, which threatens to trap them in another dimension. “Save Me Plz” by David Barr Kirtley—One of the best tales in this book, a sword-wielding adventuress goes off in search of her ex-boyfriend who has mysteriously vanished from his college dorm room after obsessively playing a game based on real life. “Anda’s Game” by Cory Doctorow—A rich story filled with world building that tackles the complexities of class struggle as well as being a young girl who finds her gaming life to be superior to her real life, until it isn’t . . . and then it is again. “Select Character” by Hugh Howey—A surprisingly uplifting, sweet tale about looking at gaming from a different perspective. This closing selection is not quite as impactful as some of the other stories in the book, but it’s a great take on subjectivity, well written, and fitting on so many levels. Overall, Press Start to Play is highly recommended and comprised of so many brilliant tales, one cannot help but long for a second installment after unlocking the first. Eric J. Guignard is an author of dark and speculative fiction. He has also been editor of anthologies including the 2013 Bram Stoker Award-winning After Death. . . . As well, he is a technical writer and college professor.